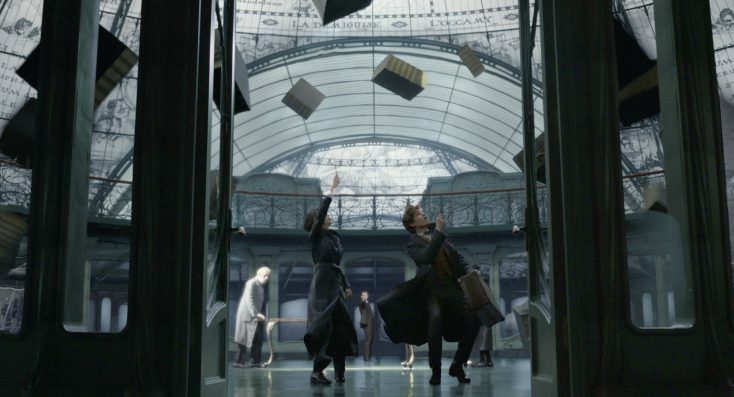 (L-r) WILLIAM NADYLAM as Yusuf Kama, CLAUDIA KIM as Nagini, DAN FOGLER as Jacob Kowalski, EDDIE REDMAYNE as Newt Scamander, KATHERINE WATERSTON as Tina Goldstein and CALLUM TURNER as Theseus Scamander in FANTASTIC BEASTS: THE CRIMES OF GRINDELWALD. ©Warner Bros. Entertainment. The film, due in theaters this Friday, is the highly anticipated sequel to the 2016 film, which itself was set decades before the “Harry Potter” films. Once again, the film is written and produced by Harry Potter author J.K. Rowling and directed by David Yates (who also helmed the final four “Harry Potter” films). To recap: At the end of the first film, the powerful Dark wizard Gellert Grindelwald (Johnny Depp) was captured by the MACUSA (Magical Congress of the United States of America). In the sequel, he has escaped custody and is building a following, many of whom are unaware of his secret agenda, which is to raise up pure-blood wizards to rule over all non-magical beings (a.k.a. no-majs or Muggles). To thwart Grindelwald’s plans, Albus Dumbledore (Jude Law) enlists his former student, Newt Scamander (Redmayne), to help him. Love and loyalty is tested among family and friends as the wizarding world grows increasingly divided. Oscar winner Redmayne (“The Theory of Everything”) and Waterston (“Alien: Covenant”) arrive together for an interview to talk about this newest installment of the popular fantasy series and the exciting developments with their characters in the sequel. They quip that their constant togetherness lately in interviews seem more like couples therapy sessions. Q: This movie takes a hard turn for your characters this time around, doesn’t it? Redmayne: What Jo (Rowling) has managed to express is that often, in long distance relationships, any relationships, communication is essential and if these two could just sit down, have a cup of tea, maybe a martini, talk it through, they’d realize how all these misunderstandings happen. Waterston: They’d work it out in about two minutes. Unfortunately, the world’s falling apart and we don’t have time to shoot the breeze. Redmayne: We’ve got wizards to detain. Redmayne: I really only got to do the amphitheater scene with Johnny and it was extraordinary. They had built this amphitheater in Leavesden (Studios). They had thousands of extras, supporting artists and Johnny had to, with that rhetoric, had to entice them, seduce them, rally them and it’s an amazing thing when it was like theater, playing to this gigantic (audience) in the round in this gigantic space and also having a camera here that was picking up all of that subtlety of all of the protagonists that he was taking in. It was a bit of a master class, really. Waterston: I was in the amphitheater but up in the nosebleeds, so not too much. Q: The film ends with a cliffhanger. Do you have any idea what will happen in the next installment? Redmayne: We got off a plane the other day and J.K. Rowling had tweeted that some of the next film would be set in Rio de Janeiro and that’s the first we heard. We were like “Carnival in Rockford!” I would have to learn Portuguese. Q: There’s an endearing scene on the street where Newt is trying to explain that he’s not engaged. Do you like those heartfelt moments or do you prefer doing the big action sequences? Waterston: It’s actually really fun going back and forth because sometimes the intense, emotional scenes are taxing in a certain way and certainly the big stunt stuff is physically taxing so it’s wonderful to be stretched in the different directions and use different parts of your brain on the same job. The two-hander scenes where we are playing off each other and trying to surprise each other and play. Redmayne: No two days are ever the same. We’re trying to surprise each other. Waterston: And play and the simplicity of that after doing these big, complicated scenes. (She turns to Redmayne.) Like you were talking about the scene where you are on the Zouwu and you are trying to catch the case and it’s just massive physical obstacles. There is something peaceful in a way about it suddenly just being you and me. Q: Newt has a particular voice. Was it easy to tap into that again after a few years? Redmayne: Finding it again was actually very easy because the amazing thing about doing these films is—even though you do one every two years—it never really stops. I did the audiobook as Newt and the virtual-reality thing. You come in and do additional shooting then you’re doing press for the DVD so the character never leaves you, but I did have a worry going back into it. (I wondered) how easy would that be. The key to this is Colleen Atwood, our costume designer, because the second you put on Newt’s clothes you change a bit—the size of them, the shortness of the pants, the boots, the overcoat. You instantly get back into who he was. Interestingly, we tried a new costume for this because that first scene when (Newt’s) in the Ministry, we wanted to show that his wings had been clipped a bit, so we tried, with costume things, putting Newt in a normal tie rather than the bow tie and both of us were like, “Oh no! No, no, no. It can’t be that.” It felt too odd. Waterston: A lot of that stuff is instinctual, really, when you’re working with someone as brilliant as Colleen. It’s instinctual for her too. It’s very obvious when something is right or wrong. Similarly, with me, we tried on a skirt and I was like, “Are you kidding me?” It just wasn’t right. But also, I find, maybe it’s a muscle memory thing, but being back on the set with the same crew and even seeing Eddie as Newt, it just drops you back into that world so much. Thank God for that because it would be very stressful if we had to dig into it every time. Redmayne: It’s a lovely thing when you have a couple of years in-between. We never get that as actors—get to come back to parts— and weirdly, having set up the characters, they sort of marinate in you. It’s actually lovely to take them back out of the box. Waterston: Yeah. It’s like a reunion with the character every time we come back. It’s really wonderful to get to return to someone. It’s like they’re waiting there for you. Q: What have been your most memorable fan moment so far? Waterston: We were just in China and it’s the creativity of the fans that really blows our minds so much. They paint portraits of you and give you gifts; things they’ve made. On the first film, someone made this corn husk version of Tina with a little case and everything. I still have it. This imaginative world inspires people’s imaginations. Their creativity is really touching, plus it takes time to make crafts to give people. It’s really sweet that they express their devotion that way. Redmayne: Today we were at the Wizarding World at Universal Studios Hollywood and there were lots of people dressed up as Newt, but (was particularly impressed with) this one guy I saw. I remember having a conversation with Colleen Atwood about the shirt that Newt was going to wear in this film and she wanted it to have these tiny dots on so that you wouldn’t see in a wide shot but in IMAX, you would see the eccentricity of the tiny dots on his shirt. Unless you’ve looked very closely at a trailer you wouldn’t see that. There was this guy dressed as Newt with dots on his shirt. I was blown away by that. Q: Eddie, you spent some time in Hollywood trying to make it. How is it to come back now with this huge franchise? Do you go by your old neighborhood? Redmayne: I did have a moment two nights ago. One of my best friends is (“Fifty Shades of Grey” actor) Jamie Dornan. We used to share an apartment here for weeks of unsuccessful auditions and we look back on it with rose-tinted spectacles like it was a really romantic, wonderful time when actually it was hell. We were being told “no” consistently but he’s got two brilliant films out. I’m going to do a Q&A with him this evening. We were having this time-out moment in our hotel yesterday and you still pinch yourself. You drive down the streets and there are “Crimes of Grindelwald” posters. You always feel outside of it. It feels odd and extraordinary in equal measure. Previous PostPhotos: ‘Mile 22,’ ‘Narcos: Season 3,’ Complete ‘Detectorists,’ More on Home Entertainment … Plus Giveaways!